The New Whitney, a stunningly remodeled building in the heart of downtown West Palm Beach is hosting its Grand Re-Opening on Wednesday, May 25th from 5:30 to 8:30pm. Teaming up with Bruce Helander, along with a group of local artists, there will be food and drinks. and beautiful art! Come out and join us on Wednesday, May 25th (from 5:30 - 8:30pm), as we celebrate The New Whitney. There will be drinks, beautiful art and plenty of food. As the final details of a 30 million dollar, 2 year renovation are put into place, The Whitney, located in Downtown West Palm Beach is planning a Grand Re-Opening Celebration, to introduce, The New Whitney. The building recently underwent a large transformation, which began with a complete renovation of the 191 units, including new drywall, tile and appliances. Also installed, brand new stainless steel cooling towers, replacing the previous plastic versions, as well as, new carpeting and paint for every corridor. The roof top, which includes a large lap pool and hot tub, was re-designed and re-landscaped. The gym was also renovated and re-designed with all new equipment, resulting in a 1st class facility. The transformation culminated with all common areas being re-furnished and re-decorated. Bruce Helander, along with a group of local artists have teamed up with The Whitney to celebrate the Grand Re-opening. The event is scheduled to take place on Wednesday, May 25th from 5:30 to 8:30pm. The evening will begin with a ribbon cutting ceremony by the Mayor of West Palm Beach, Jeri Muoio. The local artists' work will be on display in the west lobby, which will be open to the public. Once guests have taken in the artwork inside, they can travel outside, as Evernia Street will be closed in front of the building to make room for local food truck vendors. While sampling the many flavors, guests can stroll the sidewalks, visit The Whitney businesses and view The Dreyfoos student's artwork that will be on display. Jennifer Ross from Sunny 107.9 will be making a live appearance during the event from 5 - 7pm. For those that cannot attend the event, from 6 - 7pm tune into Inside West Palm Beach with Barry O'Brien, who will be broadcasting live from the event. Come out and join us as we celebrate The New Whitney. There will be drinks, beautiful art and plenty of food. 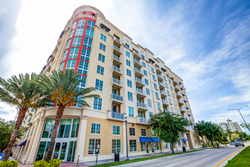 The Whitney in West Palm Beach is an 8 story, 210 unit condo building located in the heart of Downtown, just 2 blocks from CityPlace and 2 blocks from Clematis Street. The Whitney features one bedroom condos from just under 800 sq ft to three bedroom condos over 2100 sq ft. A truly unique feature in Downtown West Palm Beach, The Whitney has luxury penthouse units with their own private rooftop terraces that take advantage of the city/ocean views and West Palm Beach climate. Another great feature is The Whitney’s one bedroom with den, over 1000 sq ft, as it is a unique and hard to find floorplan in the Downtown West Palm Beach condo buildings. The Whitney is also known for its unique ground floor lofts that are live/work lofts, great for the young professional Downtown that has a suitable business, and can combine work and play! The Whitney has condos both for sale and for rent – come see why people love this building! Brightline is a company bringing an express train service that will change the future of Florida’s transportation for the better. They are the people behind the reinvigoration of a century old railway that will soon connect the cities of Miami, Fort Lauderdale, West Palm Beach and Orlando like never before. They are in the business of overthinking ahead. Building new urban centers strategically located in the places you'll want to be, near the commuter trains, buses and cabs that will deliver you to the places you want to go.